Adjustable 20,000 – 32,000 Btu. The Grape Style Chiminea is our most popular outdoor fireplace design. The excellent qualities of Cast Aluminum construction ensures many years of worry free use with very little maintenance. The Grape Leaf design is based on a Mexican clay design that has been produced for over 400 years. Once made of Clay now the same rustic style is available in Cast Aluminum providing a much safer, weather durable chiminea. If you liked your old clay chiminea, you’ll love our Grape style Cast Aluminum. A full size fireplace that makes a great centerpiece for entertaining friends and family. The included deluxe ceramic logs and gas conversion provides the enjoyment of an outdoor fireplace without the hassle of wood. 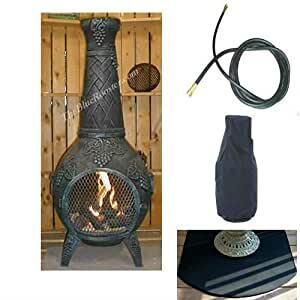 The Grape chiminea can be converted to a wood burning fireplace by removing the gas components and converted back to gas again by simple installation. Propane and Natural gas not recommended for outdoor cooking. Contact your local Gas Company for natural gas installations, propane installations can hook directly to propane tank or grill. – Adjustable 20,000 – 32,000 Btu. Assembled Dimensions: in. x 22 in. x 52 in. Assembled Weight: 87 lbs.Shipping Weight: 90.00 lbs.